While I still have some embellishing to do, it's time to settle down into choosing a background. Usually I just know what I want to do, and just go ahead and do it. This time, not so much. This is the pieced background. It's more blue than the photo, but the darker accent fabric does have a grey undertone. I'm just not feeling it. 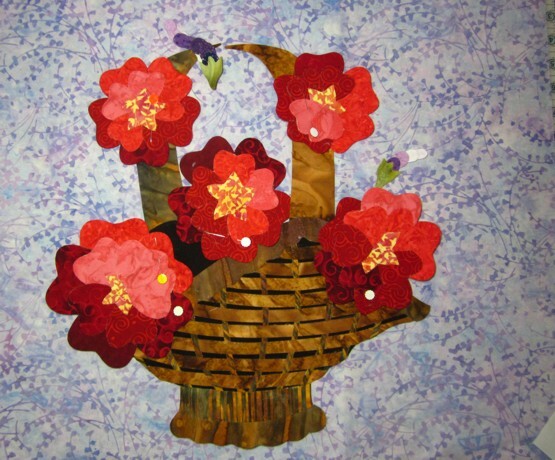 It seems as though the background can't stand up to the vibrant colors of the applique. What do you think? This is choice number two. I love the print, but I think the fabric is just a little too purple.I fear that the purple larkspurs would be completely lost. So the question becomes, do I keep the background and make the larkspurs over in blues? While I like the silveryness of it, it also feels a little underwhelming compared to the appliques. 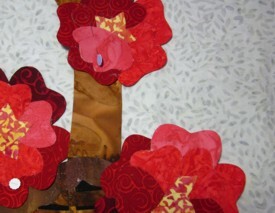 So, do I want a quiet place for the applique to shine, a background that truly fades into the background? This fabric would give the whole piece a bit of understated elegance. And then there's this background. Wowsers! I am really, really liking this. I like the linear, yet curvy print. It reminds me of a tin ceiling, only on drugs. The flash has washed out the color a bit around the applique, and I like that effect. I'm going to see if I can mimic that with pastels or water color pencils. I can imagine following the print on the fabric for machine quilting, it would give it a tufted appearance, especially if I put a small something in the centers of the tiniest squares, like a bead, maybe? Can you help me choose? Really, I'd love your opinion. Shall I go for a quiet or bold background? Beaded background, really? At last! All can be revealed! The super secret project that has kept me busy since Thanksgiving is ready. After months of preparation, almost as intensive as writing a book, I spent several days in January at the studios in Denver, Colorado, taping my first online class with Craftsy. Even though I've already tons of time in front of a camera (two Simply Quilts shows, too many to count episodes with Kaye Wood and even a show with Alex and Ricky), I was still nervous. Of course I was, I have a great face for radio. But, my terrific crew put me right at ease. Even though we worked very hard, it was at a stress-free pace. I'm hoping that you will find this online class to be (almost) as good as taking a class from me. (I couldn't be quite as silly as I usually am in class, I do the jokey stuff while the students are busy working. Just imagine that I'm telling stories between the lessons.) As I watched the class for the first time yesterday, I was thrilled at how it all turned out. Even my make-up looked great, but of course it would, their make-up artist is Danica Jardien, who has made some very famous people look great on screen. The camera does add weight, though, in my case about fifty pounds. Edit: The link for the discount is now disabled, but the class is still available. Craftsy has sales regularly, so you still may find it at a discount by going to here. 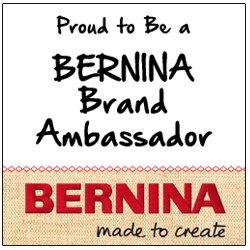 If you'd like to sign up for the class, click here for a 50% discount on the regular class fee. It's a limited time offer (I'll switch the link back to regular price on Feb. 28), so shop early and often! Honestly, I have to admit to being a big fan of Craftsy. Being pathologically curious, I have signed up already for about a dozen classes. These are no choppy You Tube videos, they are high quality, well designed video classes, providing excellent instruction for less than the cost of a workshop at a conference. I enjoy watching the classes on my tablet while I'm poking along on my applique. For me, these classes are the perfect answer for someone who loves teaching but doesn't love the travel. I have already sent in a proposal for a piecing class. We'll see if they like it. Coming up, in just about a month, I'll be teaching at Quiltmaker's Block Party event. It looks to be just tons of fun, with a cast of terrific characters in the teacher line-up. Click here to find out more about the party in Portland, Or. 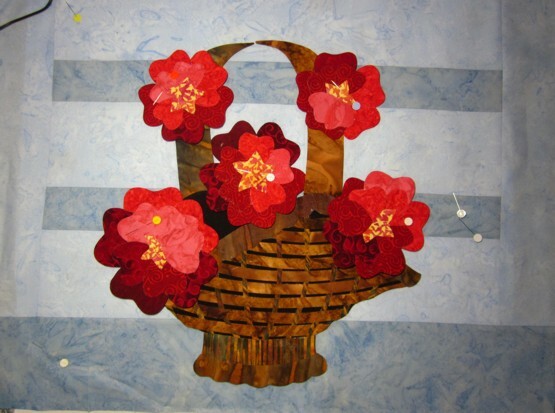 Read my original blog post to see the special applique project I'll be teaching. 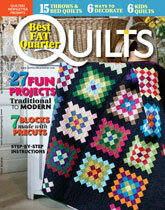 Also, check out the latest issue of Quilters Newsletter's Best Fat Quarter Quilts. I have a project on page 58. It is on the newsstands now, and can even be purchased as an ezine! I'm a big fan of ezines, no more piles of magazines that have only been read once, no more guilt about tossing them out. Anyway, My Momma's Garden is a fun-to-piece quilt and a great stash buster, my kind of quilt. In other news, I have been to Georgia and back, visiting with the Hall County Quilt Guild, a trip that I thoroughly enjoyed. And then I spent a week feeling rather yucky. No, I didn't get the miserable cold from anyone in Georgia (there was no kissing on the lips! ), but it did knock me off my pins for several days. I even spent an entire day in my pajamas, which for me is just about one step away from hospitalization. I didn't even knit! The progress on Of a Summer's Day is slow, but steady. 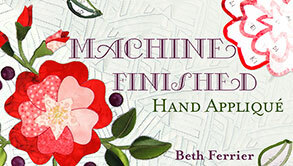 I've done all the machine stitching on the motifs, so they are all put together and ready to embellish. I've also sewn together my prototype background. The actual color is more of a cheerful, clear blue, not so gray, and the contrast between the two fabrics is not so pronounced. As an experiment, I've pressed the seams open. Usually I have an accent fabric that I want to emphasize. This time I wanted the two fabrics to be equal. It will be interesting to work on a flatter surface, to see how the light plays with the quilting design. I'm still on the fence, but I won't decide until I've laid out more of the applique. Most of the background will be covered. What do you think? Stitching everything to the background is the last step, so I still have plenty of time to change my mind, perhaps even repeatedly.